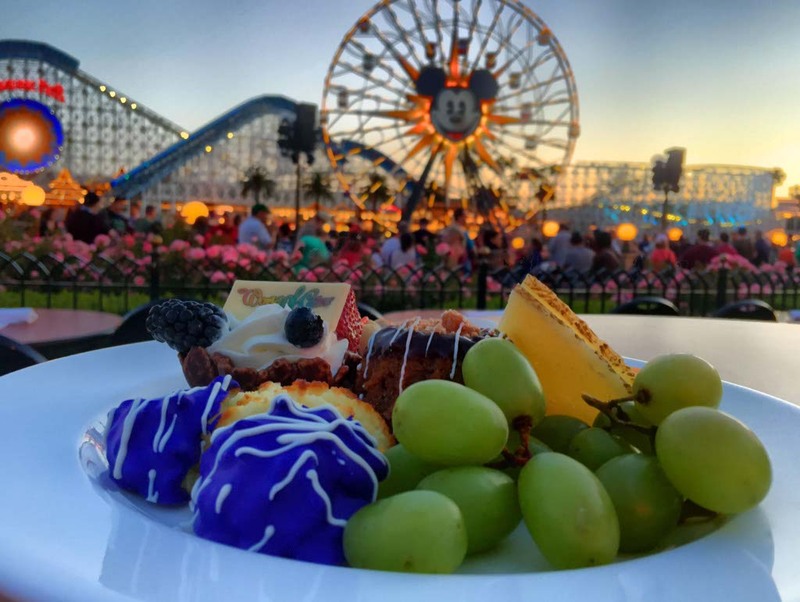 Any trip to Disneyland is a magical experience but we recently indulged in the World of Color Dessert Party at Disneyland and we felt like royalty as we dined on delectable sweets and watched the World of Color water show from sensational seating in Paradise Park. I struggled to believe that Disneyland could be any more magical, but the World of Color Dessert Party is the icing on the cake. 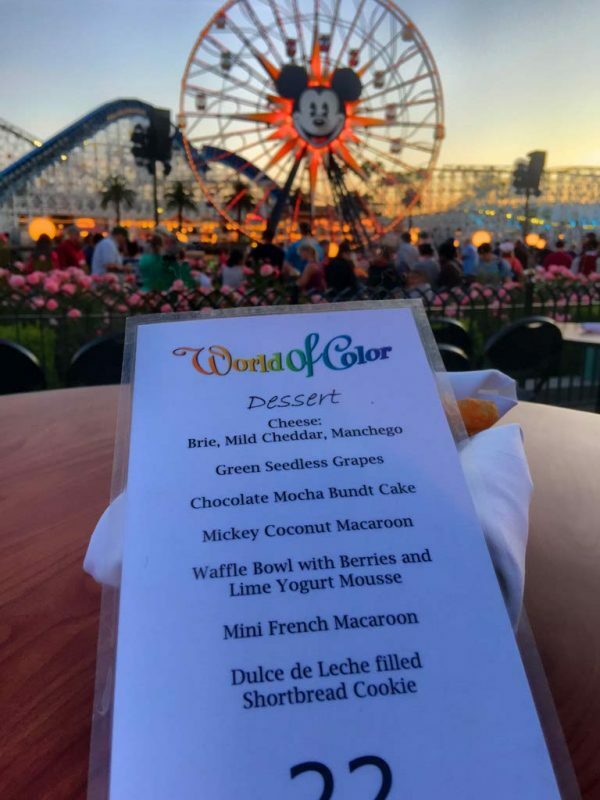 The World of Color Dessert Party includes a sweet and savory dessert selection served with sparkling beverages. 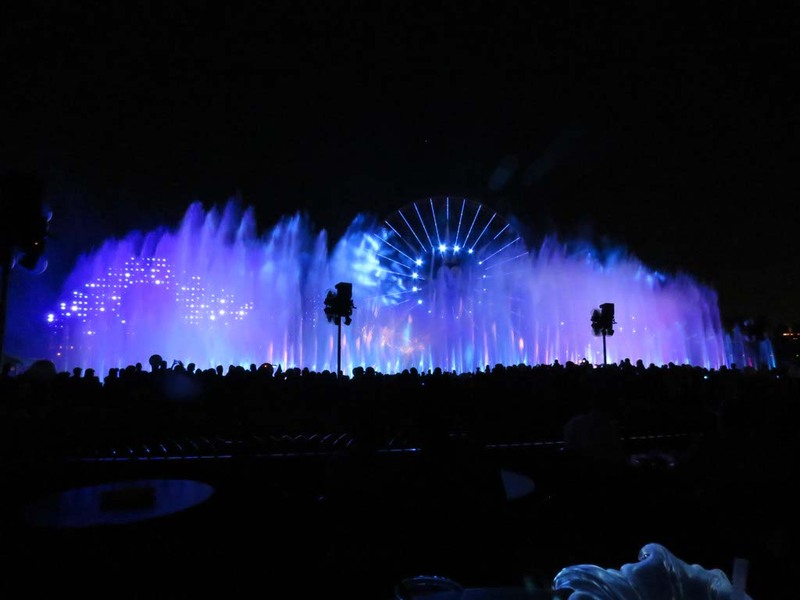 There is reserved seating in the World of Color preferred viewing area, located at Disney California Adventure Park and it puts you in the perfect spot to enjoy the show. 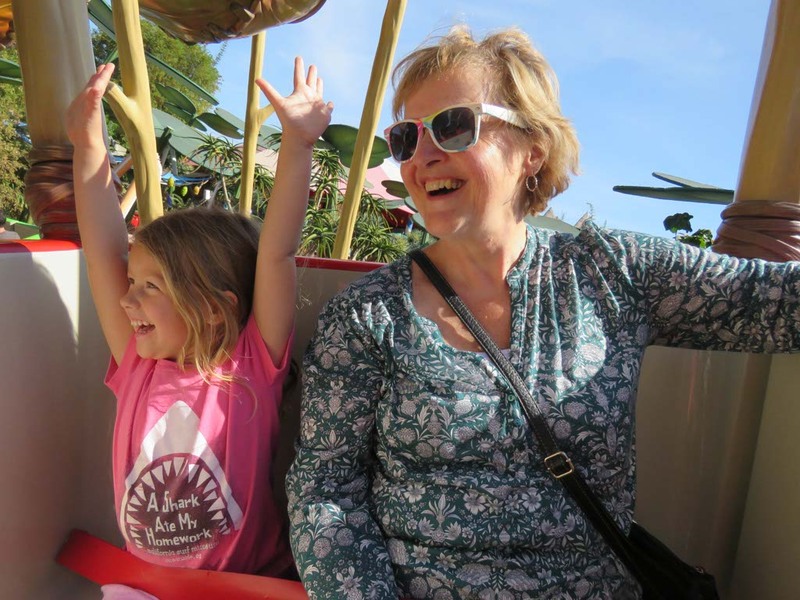 We spent the day at Disney California Adventure Park and rode every ride possible. Some of Athena’s favorite’s include Flik’s Flyers, Luigi’s Rollickin’ Roadsters, Mater’s Junkyard Jamboree, Mickey’s Fun Wheel, and The Little Mermaid ~ Ariel’s Undersea Adventure. For the first time, we rode Radiator Springs Racers where you zoom through the desert landscape of Cars Land, inspired by the Disney Pixar movie Cars. It starts off with a leisurely drive through the story of Cars and ends with a fast-paced race against another car. The sheer look of terror on Athena’s face as we raced the other car was enough to tell me she wasn’t ready for the ride. I know I’m a terrible parent, but I couldn’t help but laugh as she sank further and further into the seat and her face dropped from pure joy to complete horror. When the ride ended, I asked her if she liked it. She said, “Yes. I’m glad we raced the other car, but I don’t want to go back on the ride again.” She replied as she wiped the sweat off of her face. I have to hand it to her, she really is willing to try everything. 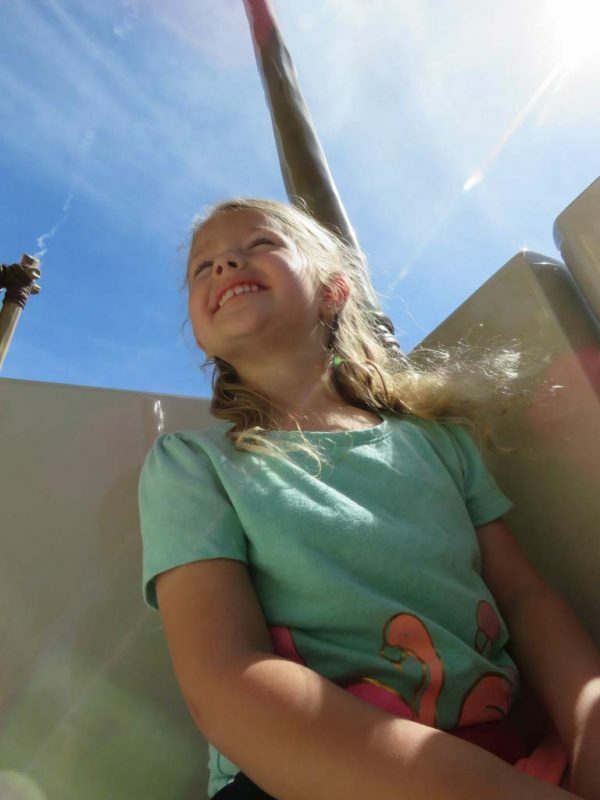 Even after she was petrified on that ride, she was immediately ready for the next adventure. It’s that drive and excitement that encourages me to push the limits with her in the first place. We made our way over to Paradise Park area and enjoyed some of the smaller line rides like the carousel before the World of Color Dessert Party began. The Little Mermaid ~ Ariel’s Undersea Adventure is a great ride if you don’t want to wait in line very long. The line moves extremely quickly and it’s a musical treat as well as a break from the sun since it is an indoor experience. The World of Color Dessert Party began at 7:30. We were shown to our assigned seats and a waiter immediately took our drink order. There were a lot of drink options including alcoholic and non-alcoholic beverages and drinks were unlimited. Every guest received their own dessert plate filled with cheeses, fruit, and desserts. My favorite part of the experience was the glass that Athena’s drink was served in. It lit up and changed color with the lights from the show. As the lights magically danced in different colors and heights before our eyes, the glass changed in unison. Athena was amazed! 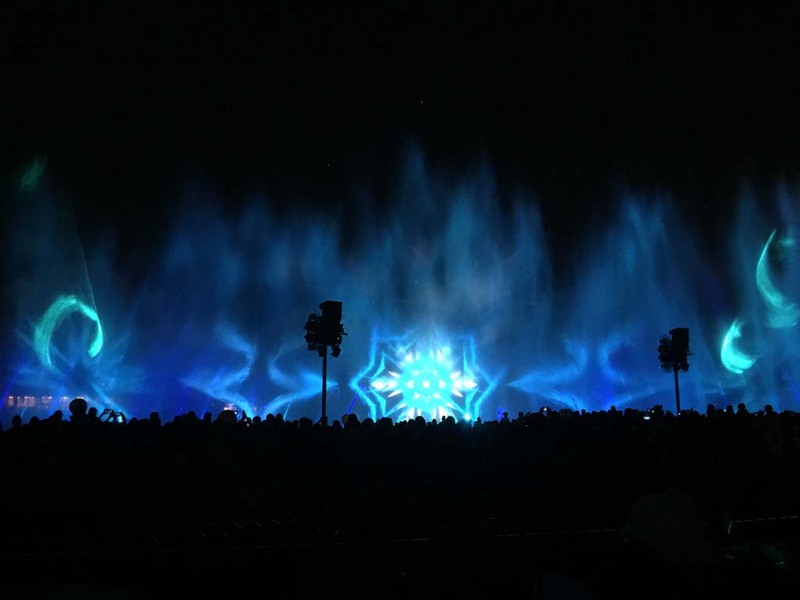 World of Color progresses through the history of Disney with songs and video clips from some of the greatest moments in Disney history. When Elsa appeared in the projection and Let It Go played, Athena stood on her seat and sang along. She knew every word and sang loudly for everyone to hear. Normally, I’d ask her to lower her voice a little or to sit down but I figured this was her moment and I let her express herself. The joy on her face was enough to make anyone that saw her understand that this is what Disney is about. It is, after all, the happiest place on earth and she might have been the happiest kid in the park. No other guests in the entire park had private seating for the show and space is limited. It truly adds a magical touch to the day. We always have an amazing day at Disneyland but we usually leave before the evening shows begin. 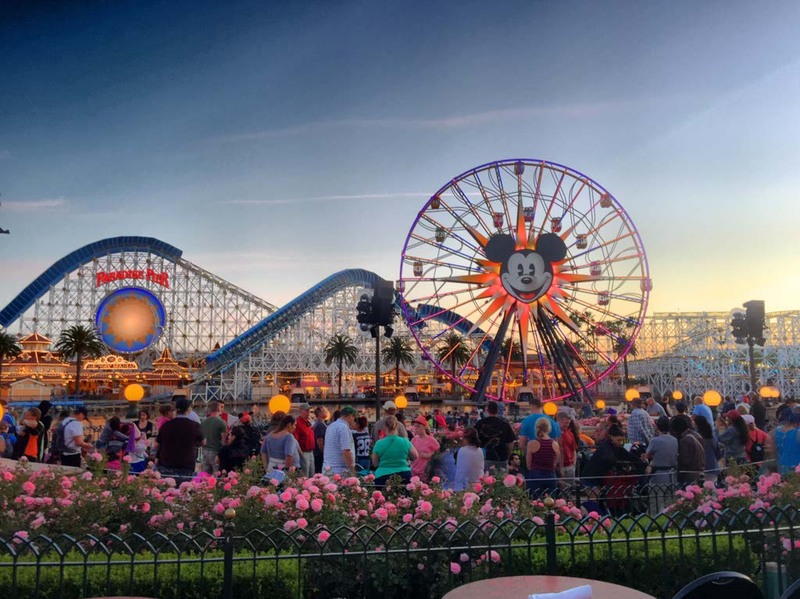 Experiencing the World of Color Dessert Party isn’t something that you need to do every time you visit Disneyland but it is certainly something you need to experience once or twice. 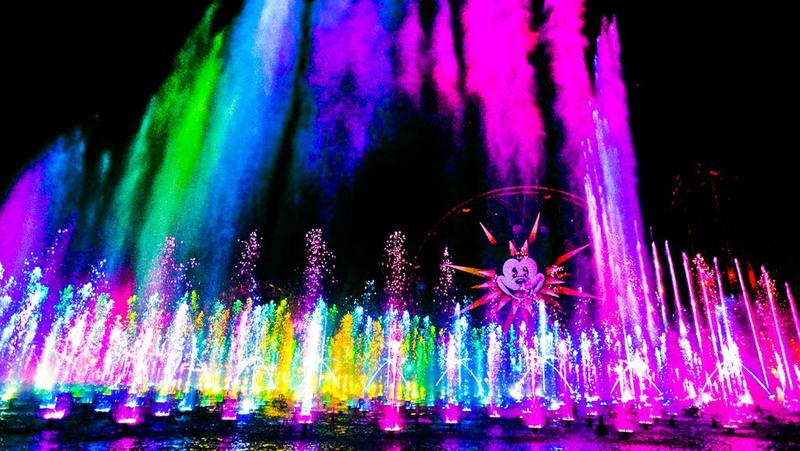 Of all Athena’s Disneyland memories, the World of Color Dessert Party sits on the top of the list for greatest moments. It was like attending a rock and roll concert but with all of Athena’s favorite movie characters and songs. This looks magical and beautiful! Keeping this on my to-do list when I make it to Disneyland some day!